Keep track of your Continuing Education Credits with the AIPG CPD Online Program. 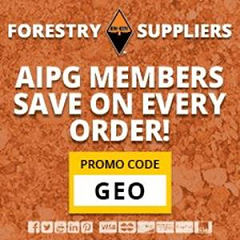 AIPG Members receive 7 percent off all orders at Forestry Suppliers. Order via the Forestry Suppliers website or call 800.752.8461. CPD Tracking Program for AIPG Members - click here to open your record or to create a record to track your continuing education and professional development activities. UPS is pleased to help members save time and money through special services and shipping discounts. We put the power of logistics to work for you every day by providing speed, outstanding reliability and technology tools so you can focus on your business - not your shipping. Website Support - The AIPG National Headquarters office will setup and maintain a simplified web page for any section that requests it. Information that is to be included on these sites must be e-mailed. AIPG Section labels - can be e-mailed free or mailed for a minimal charge. Free AIPG Publications - online in pdf format. Discounts on AIPG Insignia items (20% when quantities of 10 or more items purchased). AIPG Booth - available to Sections (Sections pays for shipping both ways). Web Sources for Geological Education Activities and Lesson Plans. Have you been asked to give a presentation to a local school, scout group, or other community group? Need some ideas on what to say? AIPG Membership Database - information available via e-mail for sections to produce section directories or for other AIPG business. AIPG General Information (History, Why Become a Member, Bylaws, Code of Ethics, Policies, Procedures, State Geology Boards, Specialty Codes, Executive Committee, National Committees, Past Executive Committees, EFG, and more.